PQI introduced the H552V, a new USB 3.0 2.5" HDD available in capacities of 500GB, 750GB, and 1TB. The disk measures 80mm x 129mm x 15.5mm (18.5mm for 1TB model) (L x W x H) and weighs 145g (500GB/750GB/) or 150g (1TB). 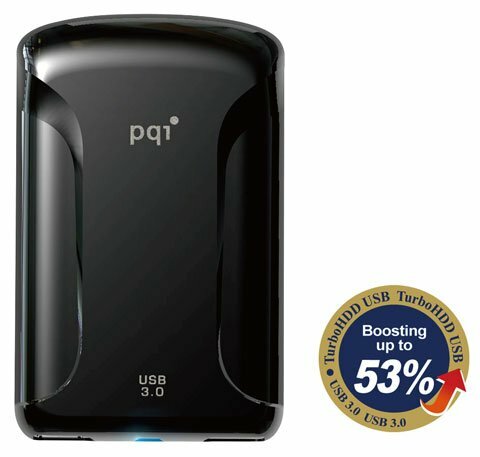 Power Quotient International (PQI) has just released its all-new H552V USB 3.0 2.5” portable hard drive! The drive features sharp and refined curves that create a stylish sports car-like appearance, a dual curved back case that lends it a stunning beauty, and a precision engraving polishing technique and ornate buffing that manifests a high quality combination glossy/matte black finish. The device’s smooth surface texture, which is both aesthetically pleasing and comfortable to the touch, subtly exudes a reserved sense of extravagance. The PQI H552V boasts stylish race car-like curves and also features a USB 3.0 transfer interface crafted like a hawk-eyed double headlight. The bright LED light at the center of the headlights clearly displays transfer status to help avoid interrupting data transfers—and thereby losing one’s important data—as a result of accidentally removing the device at the wrong time. In addition to its remarkable appearance, PQI’s H552V provides 3 different capacities to choose from: 500G, 750G, and 1TB. The back of the device features 4 specially-designed grip pads to effectively prevent sliding, reduce noise while the drive is in use, and avoid undesirable scratching. As users increasingly demand higher quality multimedia, the highly anticipated introduction of the USB 3.0 interface not only provides a maximum transfer rate of 5Gbps/sec—which is 10 times faster than USB 2.0 (480Mbps/sec) and is a great time saver for data transfers—but is backwards compatible with USB 2.0 as well. Its stable current helps prevents data loss and makes it consume less power consumption and be more eco-friendly. Because PQI pays attention to the needs of consumers, the H552V comes with exclusive software for data security protection and large file transfers. It also has a special TurboHDD USB acceleration device which offers data transfer rates up to 53% faster than average external USB hard drives, which greatly reduces waiting times during large file transfers. In addition, Ur Fortress data encryption software utilizes AES256 encryption technology to provide high-level data security for users, including data protection for classified files and guaranteed privacy for personal photos so that users can back up data and manage file encryption more efficiently. Users may also visit the PQI global website and download the Ur-Smart Mobile Office Software to bolster mobile management of personal documents and achieve higher efficiency. PQI continues to work towards advancements in technology in order to a build a better and more convenient life for all.